We’ve got Hunter and his family tracking down some pretty pissed-off San Francisco ghosts in “The Case of the Haunted Safeway.” The story involves baseball and the homophobia that, sadly, is still prevalent in professional sports. It’s not as bad as it once was, but this story is about what it once was. And, yes, it involves a haunted Safeway in San Francisco (a tip of the hat to Christopher Moore). The collection is edited by Charlaine Harris (of “Sookie Stackhouse” and TRUE BLOOD fame) and Toni L. P. Kelner. They were fantastic to work with. I was pretty much floored when Toni and Charlaine invited me to participate (I believe my reaction was, “wait, the Charlaine?”). I hope they invite me again the next time they open up the sandbox. The collection has some crazy talent lined up, including the amazing Joe R. Landsdale, Mercedes Lackey, the people listed on the cover at right, and more (I’ve now met Brandon Sanderson and Seanan McGuire in person, and found both to be wicked-smaht, delightful people). I love my story and I think y’all will too. 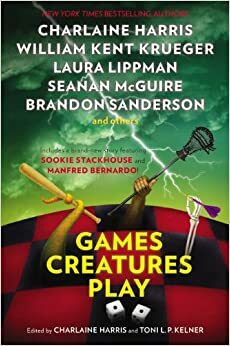 I talked some big smack to Charlaine and Toni about the purchasing power of my fan base, so pre-order this sucker, Facebook about it, Tweet about it using the hash-tag #GamesCreaturesPlay and the url tinyurl.com/gamescreaturesplay. Or, just follow me on Twitter and retweet my pimpage. @tracy: Tracy that is delightful to hear. Welcome! We’re thrilled to have you as a fan, and do spread the word. I heard about this on the Friday fix and was like “NO WAY!!! Two of my favorite authors in one place!!! !” May have gotten a lot of wired looks from my family, but so worth it. Getting this A.S.A.P!!!! @vandazle-hunterson: Awesome! I hope you dig it. Pre-order complete. Is it March 31, 2014 yet? Ordered, FB’s and tweeted. C’mon Junkies, let’s show the power of the Sigler Stank! Nice! And when it’s out, y’all can leave reviews touting my story as the reason you bought the book. That’ll show ’em for leaving me off the cover! (not mad about that, by the way, thrilled to be part of the project, but the disbelievers must be shown).